Editor: William J. MurrayIn this issue: Obama: Protect children from guns and abort more babies / U.S. needs U.N. permission but French don’t? / Does Nancy Pelosi run the House? / Pelosi appoints “Arab-American” as Chief of Staff / Senator Cruz on Obama’s “exploitation” of children / Rupert Murdoch worse than Al Gore? / U.K. politician arrested for statement on Islam / Muslim vigilantes in London enforce sharia. Obama: Protect children from guns and abort more babies – What a contradiction: Obama on the platform with four children telling the nation that kids need protection from guns, and using the massacre at Newtown, CT as an example. During the Obama Administration, the amount of money going to the abortion industry has reached new heights, with Planned Parenthood receiving 45% of their budget from the government. In the last three years Planned Parenthood has murdered about 1,000,000 babies. U.S. needs U.N. permission but French don’t? – The French government has begun bombing Islamists in Mali and has dispatched 2,500 troops so far. Rather than tell the French to get United Nations “approval,” Obama has congratulated their move. This is the same Barack Obama who as Senator insisted that the United States receive UN permission for any military operations. The Al-Qaeda forces have been well armed by our Libyan “allies.” The truth is the Arab Spring supported by Obama has created several failed states in North Africa that are now used by Islamists to attack “infidels.” Weapons sales and give-a-ways to these nations need to stop now. Does Nancy Pelosi run the House? – Since the 113th Congress was sworn in, the two most important votes were controlled not by Speaker Boehner but by Minority Leader Nancy Pelosi. In the first major showdown on taxes and spending, the Speaker was unable to get enough Republican votes to pass his compromise bill that including raising taxes on those making over one million dollars a year. Nancy Pelosi took over and with the help of a few GOP members passed Harry Reid’s Senate bill. Next, the Speaker rejected the pork laden Senate bill for aid to the victims of Hurricane Sandy and offered a bill that did not send money to Alaska, Illinois and other states. GOP Tea Party Members still refused to vote for the bill as too costly. Again, Nancy Pelosi took control of the vote and managed to pass the much more expensive bill from Harry Reid’s Senate. With a divided caucus, Speaker Boehner has grown silent as he has no bargaining chips to deal with Obama, without the support of his Members. Pelosi appoints “Arab-American” to chief – Nancy Pelosi’s office announced that her long-time chief of staff John Lawrence will retire and that his replacement will be Arab-American Nadeam Elshami who has served as her spokesman for years. Elshami, who has been a key advisor to Pelosi, was paid $172,500 by her last year. His mother, Zainab Elberry, is an activist for the Arab American Institute and worked to defend the construction of the mega mosque in Nashville. 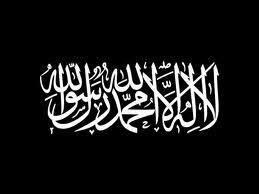 One version of the black flag of jihad. The text is actually the Islamic statement of faith (shahadah) . The flag image varies but is used by by those killing Americans in Afghanistan as well as America’s allies fighting against the Syrian government. Algeria: Islamist attack on Algeria – For several days the attack on a giant BP natural gas plant in Algeria has been on the front pages because hostages taken included Americans, British, French, Dutch and Japanese. After an attempted rescue in which 18 of the Islamists were killed, the Algerian government issued a report that they identified the dead men as being from Egypt, Libya, Tunisia, Mali and Algeria. Of course the United States is trying to say the continuing broad war against civilization by Islamists is caused by local issues including poverty.